LAST WEEK, Israeli Prime Minister Benjamin Netanyahu orchestrated a merger between three far-right parties ahead of April’s parliamentary elections. One of them, Otzma Yehudit (Jewish Power), wants to expel all Palestinians and includes in its membership the head of Lehava, a group that organizes street gangs that target Palestinians. Netanyahu’s cynical alliance with the Israeli far right has drawn denunciations even from stalwart supporters of Israel, including the American Israel Public Affairs Committee (AIPAC). But this merger is only the logical next step in Netanyahu’s ongoing courtship of right-wing nationalists and xenophobes, both at home and abroad. Netanyahu has long been cozying up to right-wing governments in Central Europe, even to the point of indulging their national myths about the Holocaust. On February 19th, he hosted a sit-down in Jerusalem with Hungarian Prime Minister Viktor Orbán, along with the leaders of Slovakia and the Czech Republic. 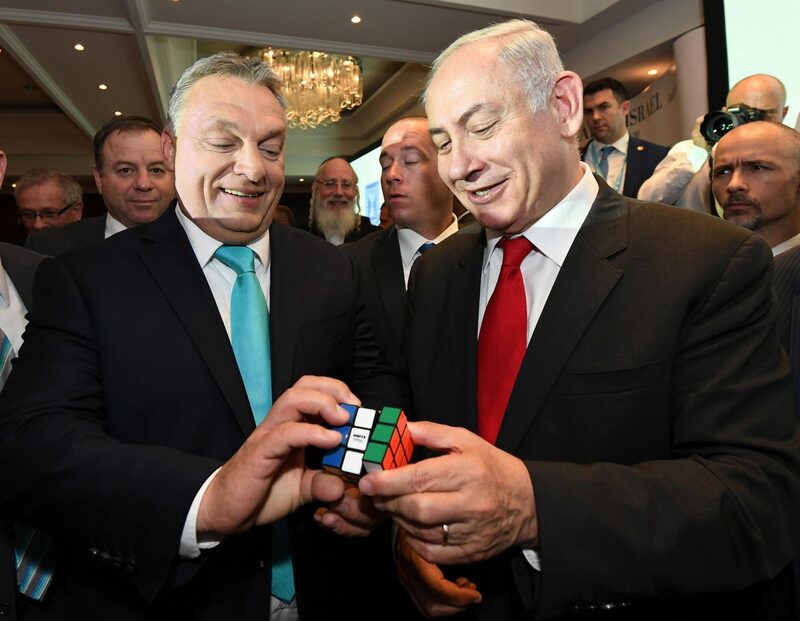 Orbán, a right-wing populist notorious for stoking the fires of antisemitism in Hungary, has nonetheless developed a close bond with Netanyahu. One Central European leader, Polish Prime Minister Mateusz Morawiecki, was conspicuously absent from the meetings, having pulled out after Netanyahu’s remark that “Poles cooperated with the Germans” during the Holocaust. But this comment, made in response to a reporter’s question about whether Netanyahu had aligned himself with Holocaust revisionists, was likely an aberration. If recent history is any guide, Netanyahu will press ahead in his quest to peel off Central European countries from longstanding positions espoused by the European Union, which has often been at odds with Israel on issues like diplomacy with Iran and the occupation of the Palestinian territories. In other words, Netanyahu’s alliance with the European right is already paying geopolitical dividends for Israel. Unfortunately, the Israeli prime minister has proved all too willing to legitimize Holocaust revisionism in exchange. LAST YEAR, the Polish government sparked a global uproar by passing a law imposing criminal penalties on anyone who says that Poland collaborated with Nazi Germany. Scholars and journalists raised concern that the law could be used against them if their work touched on the history of Polish participation in the Holocaust. Israeli officials angrily denounced the legislation as an affront to history. In June 2018, Netanyahu came to the aid of the Polish government, issuing a joint statement with Morawiecki after Poland agreed to remove the criminal sanctions dictated by the law while retaining civil penalties. The statement did acknowledge that there were Poles who perpetrated crimes against Jews during the Holocaust, but otherwise it inaccurately cast Polish actions during World War II in a more positive light. The statement claimed, for instance, that the Polish government-in-exile spoke up loudly about the murder of Polish Jews. Historians, however, generally maintain that while the exiled government did on occasion try to raise awareness about the Holocaust, it was not their major concern. A similar controversy played out in Hungary shortly thereafter. In December, Netanyahu began talks with Orbán to come to a “consensus” on the historical narrative to be presented in a new Holocaust museum in Budapest. This decision, too, was met by criticism that Netanyahu was once again giving cover to Holocaust revisionism. In fact, Yad Vashem had already come out in opposition to the museum several months earlier, saying it would likely distort history by downplaying Hungary’s role in the Holocaust. The woman tapped to curate the main museum exhibition was Hungarian Holocaust revisionist Maria Schmidt, a key adviser to Orbán who is infamous for equating the Holocaust with Soviet crimes in Hungary—a common trope among right-wing nationalists—and for writing apologia for the World War II-era regime of Miklós Horthy. Unlike Poland, the Hungarian government under Horthy allied with Nazi Germany and was directly complicit in the genocide of the Jews. For the leaders of Poland and Hungary, the benefits of these deals are straightforward. Hungary gets to avoid confronting the reality that the Horthy regime implemented almost 300 anti-Jewish laws, that Hungarian authorities killed almost 1,000 Jews in 1942, and that in 1944, nearly 440,000 Jews were deported from Hungary, most of them to Auschwitz. Poland gets to forget that Polish police and railroad workers guarded the ghettos before Jews in Poland were sent off to be exterminated, and that some Polish towns engaged in anti-Jewish pogroms even after the Nazis were defeated. The Polish and Hungarian leaders are erasing this history with the blessing of the world’s only Jewish state, shielding them against charges of antisemitism, even as both governments continue to stoke antisemitic sentiment. This past November, Poland’s leaders participated in a march alongside an antisemitic movement, and last year, Morawiecki said there were “Jewish perpetrators” of the Holocaust. Meanwhile, to marginalize opposition to his regime from the left, Orbán has made use of antisemitic tropes to demonize philanthropist George Soros, an American Jew who survived the Hungarian Holocaust as a child, claiming that Soros orchestrated a plot to flood Hungary with refugees. State-linked media under Orbán put a prominent Jewish leader on a magazine cover surrounded by money, and Orbán himself has praised the Horthy regime. All the while, Orbán has denied he is an antisemite, a denial that his alliance with Netanyahu has made credible. But the European right’s alliance with Netanyahu isn’t just about pragmatism. It also has a strong ideological dimension. Many right-wing politicians in Europe see Netanyahu as the precursor to their brand of politics, and Israel’s hardline policies as a model to emulate. The Israeli prime minister uses the Holocaust “as a tool to promote fear, and a feeling of victimhood among Jews in Israel” and in the diaspora, says Irit Dekel, an Israeli sociologist who studies Holocaust memory in Germany. “It relies on and promotes hatred and fear of Islam, Europe’s other.” In that regard, Dekel says, it dovetails “perfectly well” with the aims of the Hungarian and Polish administrations. BUT WHAT IS NETANYAHU getting out of the alliance, and why is it worth the thrashing he’s received from Holocaust scholars and some Israeli journalists? The answer is simple: The Central European leaders offer opposition to Western European powers like France, Germany, and the United Kingdom, which continue to support a negotiated two-state solution to the Israeli-Palestinian conflict. Netanyahu’s whole career has been devoted to crushing the hopes for an independent Palestinian state and protecting the gains of Israel’s right-wing settler movement, his core political base. To do so, he has had to fend off Western European pressure. Last October, Netanyahu escalated his campaign against the EU, reportedly handing a letter to German Chancellor Angela Merkel asking her government to stop funding organizations critical of Israel’s occupation. The listed organizations included the Jewish Museum in Berlin, which has hosted pro-Palestinian speakers and mounted an exhibit that included Palestinian and Muslim narratives on Jerusalem alongside Christian and Jewish ones. Meanwhile, the hardline nationalist leaders of Central Europe have no expectation of progress on a Palestinian state. The Czechs are reportedly thinking about moving their embassy from Tel Aviv to Jerusalem, and Hungary, the Czech Republic, and Romania voted to block an EU statement condemning Donald Trump’s embassy move last year. During Orbán’s meeting with Netanyahu, Hungary announced it would open a trade office in Jerusalem, a move designed to fortify Israel’s claim over all of Jerusalem, including the eastern half, where Palestinians live under military occupation. To Netanyahu, compromising on Holocaust history is a small price to pay for this support. But these compromises are also having the effect of fraying Israel’s ties with Jewish communities in Hungary and Poland. By turning a blind eye to the antisemitism that Hungarian and Polish officials are fueling, Israel is placing Jews in those countries, and around the world, at risk. Indeed, the Israeli leader has repeatedly urged European Jews to immigrate to Israel, and his government has spent tens of millions of dollars on such efforts. For Netanyahu, the future of Jewish life is in Israel, not Europe. By allying with leaders who seem bent on making Jews unwelcome in their countries, he’s doing his best to make his dream of a Jew-free Europe a reality. Noah Kulwin contributed reporting for this story. Alex Kane is a New York-based freelance journalist who focuses on Israel/Palestine, U.S. foreign policy and civil liberties issues. Follow him on Twitter @alexbkane.